Illustrated invoice for a M.H. Tilley & Son, motor engineers. Homepage. This page: A summary of work done to a vintage Rover belonging to a Royal Navy Lieutenant. M.H. Tilley & Son Motor Engineers. Featured here is one of the oldest motoring-related invoices and letterheads I have. Running to two pages, it summarises work done to a Rover motor-car between January - March 1913 at a motor engineer's shop. Evidently M.H. Tilley & Son was quite a large operation, the illustrations show the "Motor Show Rooms & Garage Dorchester", the "Cycle Showrooms & Head Office Dorchester", the "Garage Weymouth" (with capacity for 50 cars), and the "Cycle Showrooms Weymouth". 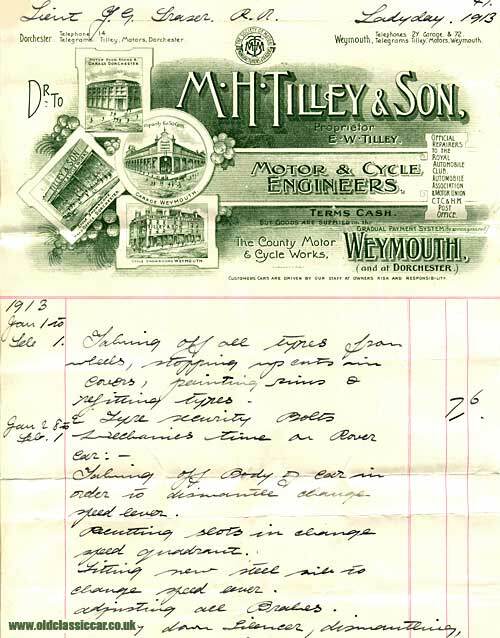 Tilley & Son were both Motor and Cycle Engineers - quite a common occurrence in those days, as many motor-car repairers started out repairing cycles, later moving into the motor-car repair business as the car's popularity increased. Tilleys were also "Official Repairers to the Royal Automobile Club, Automobile Association & Motor Union C.T.C., and H.M. Post Office no less. The telephone number for the Dorchester branch was simply '14', and for the Weymouth garage either '2Y' or '72', at a time when phone lines were quite a luxury. An early logo for the SMMT (Society of Motor Manufacturers & Traders) is also shown at the top of the invoice. The customer was a Lieutenant J.G. Fraser, R.N. (Royal Navy), HMS Antrim, Sheerness. In more recent times there was an HMS Antrim in service with the Royal Navy, but the vessel referred to here was an Armoured Cruiser, Devonshire-Class, and launched some ten years earlier in 1903 at John Brown & Co's Shipyard on the Clyde. It measured 450ft in length, and was equipped with various guns, and two 18in torpedo tubes. It fought during WW1, surviving a U-Boat attack in 1914, ending it's days in a scrapyard, late in 1922. The invoice is dated Ladyday, 1913. Ladyday isn't a term used much nowadays, but is a Christian name for the Feast of the Annunciation of the Blessed Virgin, on March 25th apparently. Further charges were then made for paraffin, oil, asbestos millboard, steel bolts & nuts, washers, split pins, & other small sundries. In February, the car received a wash & polish (cost of 2 shillings = 10p), with a further charge in March for storage between 26th January and 8th March, at 3 shillings per week (perhaps the Lieutenant was away at sea during this period?). On March 10th, there were extra costs incurred for 1 Quart of oil, and 4 gallons of Pratts petrol. It seems the car had also received wash and polish at the end of January, again at 2s cost. In all the bill came to £3 5s 11d, with payment made in July of that year. The first Rover cars, rated at 8hp, were built in 1901, with a 12hp car being introduced in 1912. This was to be the sole Rover product on sale for some time, with war work between 1914 and 1918 concentrating their minds away from new-car design. Chances are then that Lieut. Fraser's car was a Rover 12, probably a tourer. "My father Benjamin Jesty who was born about 1896 and was an apprentice at Tilley's (in Weymouth) in around 1910. He was a mechanic in the RNAS, working on sea plains based out in the Greek Islands during the first world war. He returned to Tilley's and was made foreman around 1925 and left in 1939 to help in the manufacture of torpedos at the Whitehead Torpedo Works." "My interest is with your invoice dated March 1913 which must be the period my father was at Tilleys. I have a photograph taken outside Tilley Cycle shop (near the Alexandra Gardens) of their automobile beano, depicting five cars one of which my father is sitting in, which must be about 1913." Interesting news, thanks Bernard, I'll have a look for the invoice and get a copy printed off for you.